The No. 12/14 UConn Huskies (8-0) handed the No. 15/12 Florida Gators (6-2) a tough defeat on Monday night at the Gampel Pavilion in Storrs, CT, winning 65-64 on a buzzer-beater that head coach Billy Donovan respectfully called “luck” and a “fluke” after the game. Donovan provided his perspective on the loss following the contest. » UConn knotted up the all-time series between the two teams at 1-1. » Florida fell to 4-4 against top 25-ranked opponents dating back to last season with all four losses coming away from its home court. » The Gators have lost six-straight and are 1-13 overall in their last 14 road games against ranked opponents. The Huskies improved to 11-1 in their last 12 games against ranked opponents outside their conference. » UF lost for just the ninth time since the beginning of the 2011-12 season when holding an opponent under 71 points in the game (60-9). » The Gators are now 59-78 under Donovan in games decided by five points or less. » Florida will host UConn next season in the second half of the home-and-home series. Down one with 17.7 seconds left, UConn put the ball in the hands of point guard Shabazz Napier, who to that point had scored 24 of his team’s 63 points on the evening. After fighting out of a trap beyond the three-point line, Napier dribbled into the lane and missed a wild jump shot. Luckily for the Huskies, forward Deandre Daniels knocked back the loose ball to Napier, who shot a second jumper with 0.3 seconds left on the clock that swished as the buzzer sounded. “We actually did a really good job,” said Donovan about Florida’s defense on the final possession. “We made the decision that we were going to trap him – and we did trap him – we got him to take a very, very difficult off-balance shot. The more egregious mistake, as Donovan also points out, is the fact that the Gators allowed the hosts to have three separate chances to tie the game on UConn’s second-to-last possession. The Huskies grabbed two offensive rebounds off a pair missed three pointers, and Napier finally drained one on his team’s third attempt. Napier also drew a phantom foul on the make, which Donovan was none too happy about, and wound up completing a four-point play to give his team the lead. “I was more disappointed in the possessions before where we’re up by three. It was a four-point play but watching it on film, there was no foul. But we had two opportunities to rebound the basketball. Those two offensive rebounds hurt us,” he said. For Florida to even be in the game at that point was a miracle. The Gators lost senior PG Scottie Wilbekin to a sprained ankle with three minutes to play and had no replacement on the bench. Nevertheless, UF scored nine points before the buzzer sounded – seven-straight from senior center Patric Young – and had the lead with less than 18 seconds to play after a great lay-in from sophomore guard Michael Frazier II. Donovan said that he is not aware of the degree to which Wilbekin sprained his ankle. The team will conduct further tests on Tuesday, but the player was seen leaving the arena walking on his own without a boot or crutches. Chances are that he will be healthy enough to play in eight days against No. 6 Kansas unless further examination reveals a more serious injury. » Florida played most of the contest with only six scholarship players. Junior G Eli Carter (leg/ankle) did not see the court and sophomore G DeVon Walker (sprained foot) only played for a couple of possessions. 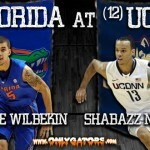 At the end of the game, UF was down to five scholarship players with Wilbekin sidelined. » Forwards redshirt sophomore Dorian Finney-Smith and senior Casey Prather combined for 11 of the Gators’ 16 turnovers on the evening. Finney-Smith had a horrible handle on the ball throughout the game, and Prather got called for travelling on numerous occasions. » Florida made more field goals than UConn but played absolutely terrible three-point defense on Monday, allowing the Huskies to hit 11-of-24 attempts from beyond the arc. The Gators made just 3-of-9 by comparison. Wilbekin did the same thing late in the second half against FSU. Cannot be a floor general and turn the ball over like that. Bad. Florida allowed three three-point attempts, two offensive rebounds on that possession and Napier will take the FT. He's OK.
All of those offensive rebounds were flukes. Just bad bounces off the rim. Gators were the better team last night. Unfortunately it wouldn’t have been luck or a fluke if the guys had rebounded as well the last 2 minutes of the game as they did the first 38 minutes. They seemed to check out at the end on the glass and UConn were getting multiple opportunities each possession. The same thing seemed to happen with FSU, for some reason, close games they have tough time closing teams out. At least it didn’t come down to missing foul shots down the stretch, but with both of their big men fouled out, you would have expected we would be dominating the glass at the end.